Review: Porcelain skin with rosy red cheeks and golden hair. A pretty pink gown with glitter and a rose. 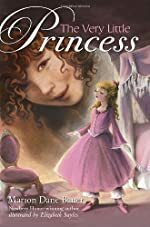 The Very Little Princess is written by Marion Dane Bauer who is the Newberry honor winning author. The Very Little Princess is one of the best children’s books I have read. This great book is about a very little princess and her experiences with, a little girl with orange curly hair and freckles, named Zoey, that little girls mom, and her grandma whom she never knew she had. This story has all the makings of another award winning story with action, and a life lesson in the end. This little princess though beautiful at the skin has a mean and snobbish personality. In this story this little princess and the little girl have to put their differences aside. They have to find out what the other likes and become friends. But there is a twist, if the two “frenimies” can’t put their differences aside the princess will freeze into an eternal sleep. Will the little girl and princess become friends? Or will the princess go to sleep forever? You can find out in The Very Little Princess. As I said before I love this book because of the way it transitions from one event to another. Also this book just in general has a sweet story about a girl whose mom just needs a break and time alone. The doll is mean at the beginning though at the end of the story they are more of friends that foes. On a one to ten rating this story deserves a 10 because of everything I’ve said about this wonderful story. This story has love, compassion, and friendship all of this is why I love this story so much. This very little princess whom at the beginning worried so much about how she looked became a loving, caring person with a friend and a heart. We would like to thank Random House for providing a copy of The Very Little Princess for this review. Have you read The Very Little Princess? How would you rate it?